The WQA Sustainability Certification Program is the first of its kind in the drinking water treatment industry. The WQA Sustainability Certification Mark verifies to distributors, dealers, retailers and consumers that a drinking water treatment product has been manufactured according to recognized industry standards for best practice in environmental sustainability and corporate social responsibility. KX Technologies and Filtrex Technologies have long considered environmental consciousness to be a central part of their corporate social responsibility as drinking water filter manufacturers and have strived to make their products and processes as environmentally friendly as possible. 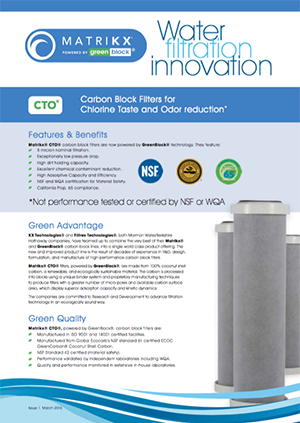 Therefore, they are very proud to be among the first manufacturers in the world to be certified under the WQA Sustainability Standards for their new Matrikx® powered by GreenBlock® line of standard sized carbon block water filter cartridges. sourcing, through manufacturing and assembly, to packaging and end-of-life management. Finally, the manufacturing company must meet the WQA S-801 Sustainable Management standard, which examines corporate governance, including social responsibility, environmental policies, goals and communications, and supplier sustainability performance. KX Technologies and Filtrex Technologies are committed to providing continuing leadership with regard to environmental responsibility within the drinking water filter industry. 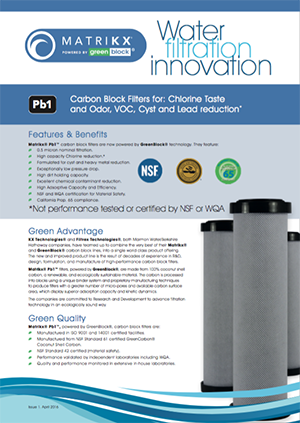 The presence of the WQA Sustainability Certification Mark on the Matrikx® powered by GreenBlock® cartridge line will enable water professionals and consumers to make an informed choice as they look for the most environmentally friendly water treatment options. However, best of all, making the “green” choice does not have to necessitate any compromise, or “cost the earth” in the financial sense either. 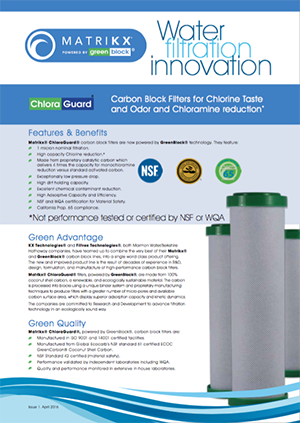 Matrikx® powered by GreenBlock® cartridges provide market-leading filtration performance at a competitive price. Making the environmentally sound choice has never been easier. For information on our products please download the relevant data sheet here. Contact If you have any questions or feedback please get in touch, we’d love to hear from you. 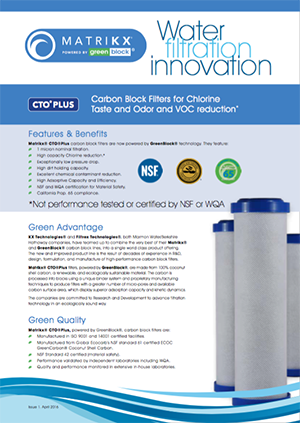 FX® and CHLORAGUARD® are trademarks of Filtrex Technologies Pvt. Ltd.
© 2019 KX Technologies LLC.